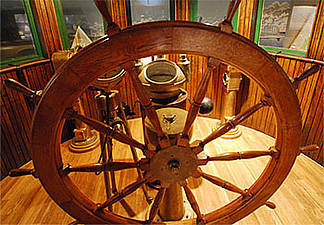 Step into an actual wheelhouse of a 1907 steamship. Put your hands on the large wooden wheel and sound Elba’s horn. Captain her as she delivers lumber, stone and other bulk cargos to ports throughout the Great Lakes. The wheelhouse has been lovingly restored to its original state. Notice the craftsmanship of the time, the rich wood that’s used throughout and the antiquated navigational equipment of the early 1900s.